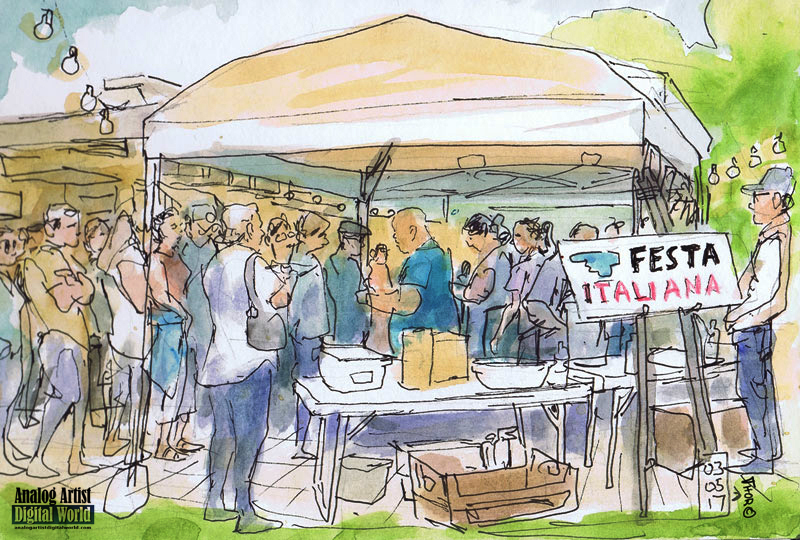 I went to Lake Lilly Park in Maitland where there was an Italian Festival. The festival was in the venue right on Lake Lilly. I parked a few blocks away at the Maitland Art Center and hiked the short distance to the festival. New cars were parked on the grass from a local dealership. I decided to sketch a food tent that was doing a booming business. They were selling freshly made cannolis. Cannoli consist of tube-shaped shells of fried pastry dough, filled with a sweet, creamy filling usually containing ricotta. The heavy set guy was stirring the cannoli custard. I believe they filled the cannolis on the spot as they were sold. I was sitting next to an Italian family. The young boy was running everywhere and the petite wife seemed to be always trying to wrangle him in. They didn't seem to mind my sketching. Once the quick sketch was done, I scouted inside. There were expensive slices of pizza. and I ordered one. On stage was a singer who was crooning Frank Sinatra classics. The next act was an accordion player. In the corner of the venue were exotic Venetian masks. Another table offered travel plans to Italy. The audience relaxed at the round tables. By the time I made my way back outside, the cannoli vendor had run out of cannolis. I was devastated. How could I write about my experiences without at least tasting a cannoli? There was an Italian ice vendor who still had product, but I didn't decided to try any. The scene inside reminded me of the wedding scene in the Godfather movie in which classic Vegas performers entertained the guests. This small event just lacked that level of professional polish. In general the vendors were commercial and not necessarily Italian themed. For instance Verizon was offering information about their Internet packages. I was desperate to get rid of At&T which gave me horrible reception in my apartment. They also never figured out how to mail me my bills, so it was stressful to have to double check to make sure i was paying them despite never getting billed. Probably because of this Italian Festival, I ended up switching to Verizon and Now my reception is better and they send me monthly bills. Life is much easier. it was satisfying to get rid of AT&T which offered literally no costumer service. In NYC there were always lots of these ethnic street festivals. I miss just running into festivals on the fly. Festivals do exist in Orlando, you just have to keep an eye out to find them.